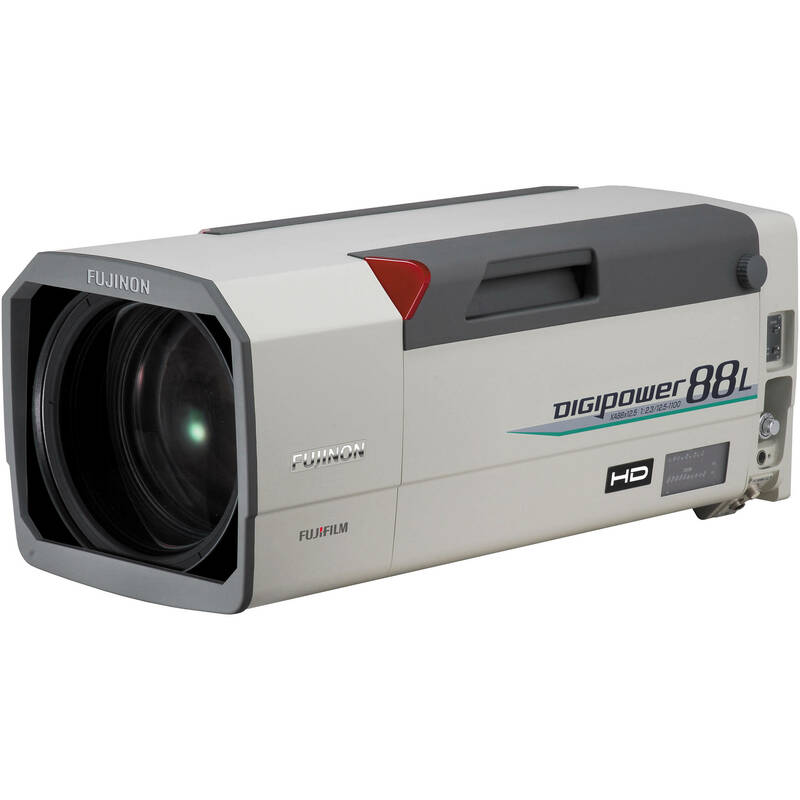 The Fujinon XA88X12.5BESM HDTV Lens for 2/3" Cameras has a focal length of 8.8-777mm, for a tremendous 88x optical zoom ratio. Moreover, a 2x extender effectively doubles the focal range. The maximum aperture is a fast f/1.7 at 8.8-348mm and stops down to f/3.8 at 777mm. The lens is manual/servo interchangeable, and an RS232 connector in the lens provides a connection between the lens and a PC, or other control device, for external control. This function has made it possible to control the lens functions with the high degree of accuracy and reliability needed for virtual studio and other robotic applications. Advanced components including a 32-bit RISC processor in the lens, a CPU in each servo demand, optical encoders and high-speed serial communication devices, together with the newly developed digital control circuit, provide 13-bit accuracy in zoom and focus control as well as a variety of new functions. Fujinon's Precision Focus Assist technology can maintain focus at any zoom position from the narrowest to the widest angle, and Aspheric Technology as well as the newly developed EBC coating reduce ghost and flare and increase light transmission. A proprietary anti-fogging design minimizes lens fogging and reduces downtime due to moisture, and internal focusing minimizes the effects of lens breathing, ensuring a more consistent focal length when making focus adjustments. QuickZoom improves zoom speed to 0.7 seconds end to end. With the push of a button, QuickZoom facilitates a rapid shift to the telephoto end to check focus. Releasing the button automatically returns the lens to the previously selected focal length. Finally, the Focused Intelligent Network Diagnosis (FIND) system aids in preventive maintenance and troubleshooting by evaluating various electronic and mechanical parameters.